So- I’m a huge geek that likes to read articles on food now and then all the time. I fall asleep every night perusing Pinterest recipes and Huffington Post’s Healthy Living sections. When I say “articles on food” – I literally mean everything- recipes, health tips, what’s trendy, how to pronounce fancy foods like quinoa [keen-wah], the latest diet fad food that I fall for every time, and so on. I once purchased a Nutrition 101 used college text book from Amazon- just to have…for reference, ya know? Do students even buy text books anymore? A common topic that I see appear quite frequently on the world wide web is the debate between organic food and their dirty evil twins- or as I like to call cheap produce/ the stuff that I buy. I’d really like to know what all of you have to say about eating organic food. You would think that with my nose in all of these nutritional books and articles that I would have a firm grasp on how important it is to eat in such a way. 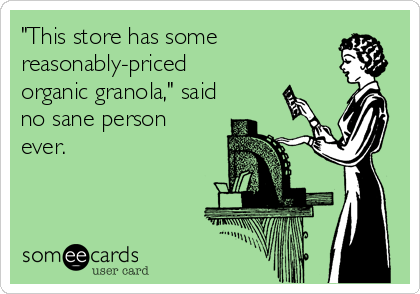 However, I’ll be the first to admit that I rarely ever purposely purchase from the organic sections. [Gasp!] I wonder how many individuals there are out there in my shoes- not practicing what they preach/ utilizing the knowledge that they hold. I pay a premium for my highlights, my gym memberships, my apartment, my clothes- am I doing the greatest disservice to my body of all by not eating organic food? 1. Do you purchase organic food? 2. If you do: which foods? Which ones are okay to surpass? 3. If you don’t: why? Too expensive? Aren’t knowledgeable enough about the topic to purchase otherwise? Here is an article from Eating Well that lists “The Dirty Dozen: 14 Foods that you should buy organic” – catch yourself up on the topic and let me know what you think!